displacement of a bone from a joint; called also luxation. The most common ones involve a finger, thumb, shoulder, or hip; less common are those of the mandible, elbow, or knee. Symptoms include loss of motion, temporary paralysis of the joint, pain, swelling, and sometimes shock. Dislocations are usually caused by a blow or fall, although unusual physical effort may also cause one. A few dislocations, especially of the hip, are congenital, usually from a faulty construction of the joint, and are best treated in infancy with a cast and possibly surgery. A dislocation should be treated as a fracture when first aid is administered. First aid includes checking for a pulse distal to the location and keeping the patient as still as possible. The patient is moved as a whole unit on a long board or a stretcher. As soon as possible the dislocation must be reduced by a surgeon. complete dislocation one in which the surfaces are entirely separated. compound dislocation one in which the joint communicates with the outside air through a wound. 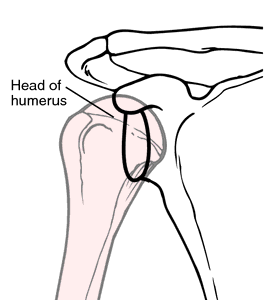 congenital dislocation of the hip a former name for developmental dysplasia of the hip. pathologic dislocation one due to disease of the joint or to paralysis of the muscles. simple dislocation one in which there is no communication with the air through a wound. Displacement of an organ or any part; specifically a disturbance or disarrangement of the normal relation of the bones at a joint in which there is complete loss of contact between the two articular surfaces. The direction of the dislocation is determined by the position of the distal part of the articulation. /dis·lo·ca·tion/ (dis″lo-ka´shun) displacement of a part. complete dislocation one completely separating the surfaces of a joint. compound dislocation one in which the joint communicates with the air through a wound. congenital dislocation of the hip developmental dysplasia of the hip. pathologic dislocation one due to paralysis, synovitis, infection, or other disease. subspinous dislocation dislocation of the head of the humerus into the space below the spine of the scapula. the displacement of any part of the body from its normal position, particularly a bone from its normal articulation with a joint. See also incomplete dislocation. dislocate, v.
Orthopedics The complete displacement of a joint surfaces. See Acromioclavicular dislocation, Congenital hip dislocation. Cf Subluxation. Separation, especially the disarticulation of the bearing surfaces of a joint with damage to the capsule and to the ligaments that hold the joint together. Displacement of bones at a joint. displacement of the articular surfaces of a joint, so that apposition between them is lost and the bony components no longer form a working joint. The cause can be congenital, spontaneous or traumatic, and dislocation may be recurrent. In sport, dislocations of fingers and the shoulder are the most common, as the result of collision with either an opponent or an object such as the ground or goal post. Replacement in position ('reduction') may be spontaneous but if not, it should be attempted early and only by a skilled operator. n forced separation and misalignment of bones in a joint cavity. Displacement of an organ or any part; specifically disturbance or disarrangement of normal relation of bones at a joint in which there is complete loss of contact between two articular surfaces. n the displacement of any part, especially a bone or bony articulation. 1. displacement of a bone from a joint. Signs include loss of motion, temporary paralysis of the involved joint, pain and swelling, and sometimes shock. Some dislocations, especially of the hip, are congenital, usually resulting from a faulty construction of the joint. 2. displacement of the lens in the eye. See lens luxation. one in which the surfaces are entirely separated. one in which the joint communicates with the outside air through a wound. one due to disease of the joint or to paralysis of the muscles. one in which there is no communication with the air through a wound. Q. I have dislocated my shoulder for the 3rd time, what I can do in order to avoid surgery? This is an old injury that keeps coming back. I have been dealing with this unstable shoulder for more than 5 years now. In the past few weeks I've visited 3 different doctors, all said that I can't avoid surgery this time or it with keep on dislocating spontaneously. Even though the docs are thinking that it's a lost cause,I got a really good feeling that I will manage to fix my shoulder 100% with no surgery involved. Is there any known therapy I should try before admitting to my surgery? Therefore, the possibility of supracondylar fracture of humerus (which is the most common fracture around the elbow in children) and elbow dislocation were kept in mind. As the rate of obesity increases, the rate of knee dislocations increases. A previous study conducted on PIOLs indicated that a traumatic dislocation occurs in approximately 1 out of 662 cases. 6 In this study, 1 case accepted emergency nerve exploration for concomitant injury of sciatic nerve and we found that the femoral head in posterior dislocation lancinated the posterior capsular. In our study, the patellar dislocation was mostly caused by sport injury (6 patients; 40%). Unlike dislocation of the IOL, dislocation of the lens-capsule complex can occur years after an uncomplicated surgery due to progressive separation of the zonules associated with various causes such as PEX, retinitis pigmentosa, and long axial length. They also generate dislocation displacements and affect the nonlinear stress-strain relation. Pre-reduction and post-reduction radiographs demonstrated an anterior glenohumeral dislocation followed by concentric reduction of the joint. For Rockwood grade III dislocations, surgical intervention provides a better cosmetic outcome but increases infection risk (SOR: B, meta-analysis of retrospective case series). Q/ Surgery vs conservative management for AC joint repair: how do the 2 compare? Lever effect is a type of dislocation mechanism that forces abduction and external rotation of the arm. However, there is a case report of hypotonia and weakness associated with C2-C3 dislocation in the literature that was presumed to have taken place at birth. There is some debate regarding best practice for management of primary traumatic shoulder dislocation in adolescents.